After all the hype about which smartphone supplier and display maker would be the first to deliver a true foldable smartphone, it was not Samsung, LG, Huawei, Lenovoor any of the other names that have been bandied about over the last year, instead it was California based 6 year-old company Royole. Royole announced the FlexPai in Beijing and will offer the device in three ‘flash sales’ with deliveries scheduled for late December. The phone has a 7.8” screen (open) can be folded, creating three screen ‘zones’, a front screen, a back screen, and a spine screen similar to the Samsung Galaxy Edge, and has been tested to 200,000 open/shut cycles. The device is expected to sell for between $1295 and $1872, depending on memory configuration (max. 256GB). A developer model can be ordered on the company’s website for $1,318. 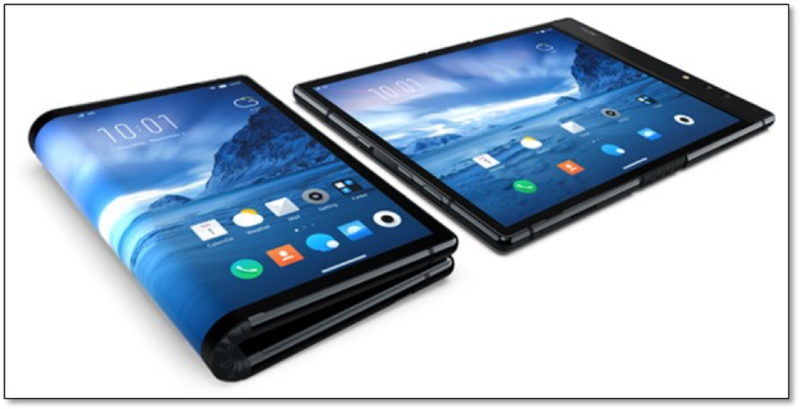 Royole’s device (RY1201) is based on Android 9.0, the most recently released version of the OS (3/7/18), using a modification called water 1.0, which is the Royole adaptation of the OS for the foldable device. Royole produces the OLED display at their Shenzhen fab, which is a Gen 5.5 flexible OLED line with 15K capacity and a Gen 6 with 24K capacity expected next year. The phone has two cameras (16MP & 20 MP f/1.8), a dual nano-SIM configuration, and a 3800 mAh Lithium polymer battery, with the usual sensor complement, but will only be supported by the three main Chinese carriers during the initial launch. The device also uses Royole’s proprietary Ro-Charge system that operates at a higher than normal voltage but maintains acceptable heat levels for rapid charging. The device itself weighs 320g (11.3 oz. ), which is slightly lighter than tablets of similar sizes, and is ~. 3” thick, when folded, it is far thicker than a typical smartphone. Despite that thickness, Royale says it can still fit in a (bulging)pocket. Royole has had 6 funding rounds since August 2015, totaling $1.1b, with investors ranging from a number of Hong Kong broad-based VCs to investments from a number of ‘investment funds’, who are actually vehicles for private Chinese investors (quasi-family office) and have only two or three investments. The company was founded by Bill Liu (35), a graduate of the well-known Tsinghua University in Beijing and Stanford, and a number of other Stanford colleagues, and the company have been considered a leader in the development of flexible displays. Royole has focused on developing commercial products using flexible OLED displays, but not smartphones.